This is a tremendously energetic St John Passion, the choruses dancing along with a vitality which recalls the secular roots of many of the chorale melodies, the solos delivered with arresting fervency and the orchestral playing crisply athletic. For Richard Egarr, this is clearly an operatic concept, and he propels it along relentlessly building to a devastating climax and drawing every last morsel of drama from the onward surge, to the inevitable tragedy. He has assembled a dream team of vocal soloists in the principal roles; James Gilchrist a highly articulate Evangelist (although he seems on the verge of hysteria as he manfully breasts Egarr's manic drive through 'Barrabas aber war ein Mörder'), Matthew Rose a distinctly human Jesus and Ashley Riches a suitably assertive Pilate. The Choir of the AAM is drilled to a state of almost frenetic virtuosity which explodes dramatically in some highly charged crowd scenes in Part 2, while the Academy of Ancient Music itself is on cracking form. 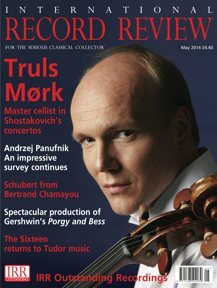 There is some gorgeous solo playing; a mouth‑wateringly delicious flute obbligato to the aria 'Ich folge dir gleichfalls' perfectly complementing the fluting quality of Elizabeth Watts's voice, and a pair of violas da gamba which float ethereally above the wonderfully focused Christopher Purves ('Betrachte, meine Seel') and develop a more athletic edge to support a neatly poised Andrew Kennedy ('Erwäge, wie sein blutgefärbter Rücken'). Other unforgettable moments include the opening chorus ‑'Herr, unser Herrscher' ‑ where the bustling activity from orchestra and chorus seems to be lovingly embraced by a pair of oboes, as if the whole world is held in the arms of God as great life‑changing events begin to unfold, and the spitting venom of the crowd ‑ both choral and instrumental ‑ as they berate Pilate in the brief 'Schreibe nicht 'Der Jüden Kënig". Musically, then, this is a splendid performance which leaves the listener exhausted both physically and emotionally. Coupled with an absolutely gorgeously presented hard‑cover booklet containing some fabulous photography and some thought ­provoking essays, it would seem to be a pretty safe choice for anyone looking for a first‑rate recording of the St John Passion. Unfortunately, there is rather more to any recording of the St John Passion than how the musicians present the detail of the score and how the recording both captures them and offers itself to the public. What we have here is, according to the booklet, Bach's original version of the work, and I am convinced that Egarr has researched his sources thoroughly and presents here music which is as close as we can get to what the congregation assembled in St Nicholas Church, Leipzig, on April 7th, 1724 heard. Similarly, as the detailed description of each individual instrument given in the booklet shows, he is also presenting the work with instrumental colours which would have been familiar to any musicians of Bach's time. I am equally convinced, however, that were Bach or, indeed, any of the musicians or congregation members involved in that 1724 performance miraculously to reappear and hear this recording, they would in all likelihood not recognize it and, even if they did, they would be appalled. To drive the St John Passion along as an operatic representation of historical events is to miss the very purpose of this music. For Bach, as for any Lutheran church musician living and working in the eighteenth century, the annual commemoration of the Passion of Christ was not just the climax of their year but also the fundamental statement of their faith. That faith was rooted in the belief that Christ rose from the dead. But while that was celebrated with the exuberant festivities of what we now call Easter Day, those festivities had purpose only if the preceding week was devoted to contemplation on the reasons for, the events leading up to and the ultimate suffering of Christ on the Cross. That extended period of contemplation reached its climax with the commemoration of the Crucifixion on Good Friday, which is when the Passion was traditionally presented to the congregation: as an integral part of a religions service and not as a musical performance in its own right. The key word is contemplation, and that is the one thing missing from Egarr's reading of this St John Passion. How can a congregation contemplate the words 'Grant us patience in this time of grief' (as the booklet translation of the chorale 'Dein Will gescheh' bas it) when they are being driven along as quickly as if they have accidentally got themselves caught up in a Formula 1 race, or ponder on 'All the suppurating sores of vice', when the voluptuous‑voiced Sarah Connolly sings of them with such gleeful relish in her aria 'Von den Stricken meiner Simder'? 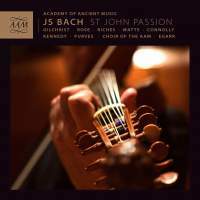 Splendid as this music‑making is, and dramatically charged as Egarr's interpretation is, I find this ultimately a misguided St John Passion, which, in providing breathtaking entertainment, offers no real scope for the inner spiritual reflection which is the essential core of Bach's creation.